Earlier this week (which oddly enough was last month), we told you about the shocking FaceTime bug that allowed an iPhone user initiating a group video chat to hear audio from each individual being called, even before the call was accepted. In other words, the bug allowed iPhone users to secretly hear private conversations from other iPhone users that were not meant to be heard by others. 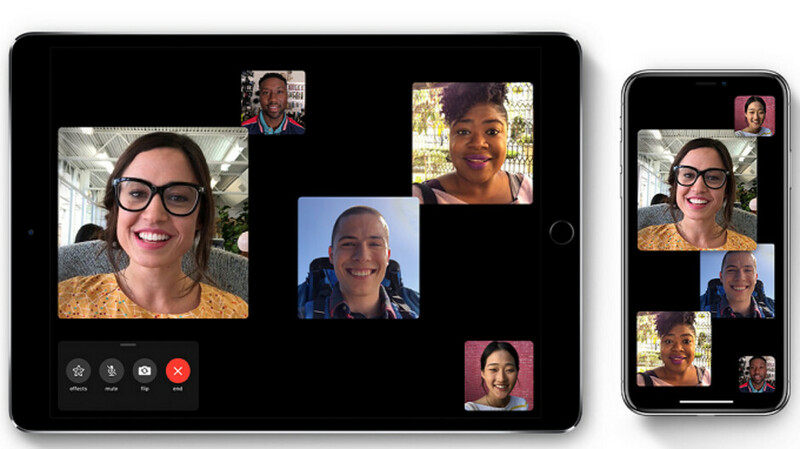 Apple quickly disabled group FaceTime, promising that a software fix would be coming this week. As mentioned this morning by CNBC, Apple released a statement in which it apologized, and noted that the problem was taken care of on the company's servers. But before you can start a group FaceTime with all your Elvis impersonator friends, Apple will first disseminate a software update next week that will once again enable the feature on compatible iPhone models. The statement also credited 14-year old Grant Thompson and his mother Michele for discovering the issue and reporting it to them. Just a couple of days ago, we relayed the whole story to you. At the time, Ms. Thompson wasn't sure whether Apple had first heard about the bug from them. The apology, found in the statement below, reminds us of the apology that CEO Tim Cook released in 2012 when Apple realized how bad its Maps app was when first launched. The difference here is that group FaceTime will be fixed quickly. Maps eventually needed to be torn down, allowing Apple to start from scratch with its own mapping data. Of course Apple is going to bend over and be apologetic. They fell flat on their face. Especially when Apple always tells everyone that they care more about your privacy and security, compared to anyone else. Right? Hey, Apple even took an ad out at CES to let everyone know that "what's on your iPhone, stays on your iPhone.". Well until this FaceTime crap happens. Or at least until you ask your HomePod to read your messages from your iPhone. But hey even the gullible and ignorant can still believe in Apple, right? What is your problem? We’re you waiting for Apple to blame the user? Intent to share your data with third parties vs. dealing with a bug are two different things that separate google and Apple when it comes to “what’s on your phone stays on your phone”. A bug that was there since October 2018. But isn't Apple all about the customers privacy and security. Plus Apple is the first one to smear that all over the public, and everyones face. My point is if anyone believes in that crap that Apple spews. Like that crap right now about "what's on your iPhone, stays on your iPhone". So how does that work again Vokilam? How does that work if you ask your HomePod to read your messages. Let's see Apple's HomePod sends a request to your iPhone via the internet. Then your iPhone encrypts and sends those messages over the internet to your HomePod, which then reads you your messages. So I guess that slogan that Apple used about your data on your iPhone, is really for the gullible and ignorant customers that will believe in that crap. Like you Vokilam. A sucker is born every minute Vokilam. Have you never heard of that sales motto? Your the perfect Apple customer. This would be an excellent point if Google actually shared your data with third parties rather than selling them advertising slots. This practice is almost exactly what Apple did with iAD Network until they shut it down 2 years ago. Almost the next day, Tim Cook started his privacy campaign. He sold Apple's "holier than thou" act even though his true motivation was that Apple couldn't come close to accumulating the amount of data that Google and Facebook were getting and couldn't generate anywhere close to the revenue from it. But hey, some people buy it. So more power to him. Why reply to me with this hate message lol, should have been it's own post mate. By good on them, I was referring to how they gave the credit to the people that found the bug, I don't care about the apology. Lol yeah, bug is intentional i guess. This is one of the worst blunders Apple has ever done. Exactly and they tried to brush it under the carpet at first, as usual. It wasn't until the big media outlets caught on that they were forced to respond, as usual. A kid reported the problem and some representatives did not take him seriously. Haters here talk as if Tim Cook and entire Apple knew about this and purposefully did something. Apple apologized and took action as soon as concerned higher-ups got to know this sh*t via media. The thing is they apologized. Haters hate that Apple apologized. Apple did a horrible thing with batteries but this is not done purposefully. Well Tim cook was contacted directly and ignored it as well. It's not as simple as some representatives not taking it seriously. It was replicated and validated and apple took no action to protect its customers until the mass media blew it up. I'm sure there are many other privacy and security concerns simply swept under the rug in Cupertino. It's not about hate. It's about Apple's high and mighty stance and position about privacy and security. They always spew to everyone and even let the competition know as well. Especially how they are the best at security and privacy, and how they protect their customers data. I guess these class action lawsuits against Apple for their FaceTime debacle will go away?. Maybe those lawyers will accept Apple's and Tim's apologies, and forget that this incident never happened. Lol, only kidding, as if they will drop these lawsuits. Gotta get it together Apple. Just way too many issues with iOS. Good thing for Apple they don’t have a fragmented mess of an ecosystem, that will allow them to deploy the update to all iOS devices at once. good thing once that bug gets fixed 5 more bugs arises making it worse. That's what I hate about iOS updates. They come fast, but usually break something else. Been that way for awhile too. drunkenjay, as with every operating system ever, mobile or desktop. Theres bugs in all of them. However, since there are so few in iOS its held to a higher standard, things like this get blown out of proportion. Difference is I don’t need to wait months for a fix on ios once its released. Really blown out of proportion? So any unsuspecting iPhone users could be heard or the data from their camera sent to someone else is blown out of proportion. This should NEVER happen, ever rouyal, period. This is the worst privacy and security bug or invasion that has happened to any smartphone or iPhone, period. The other thing is that update has been there since October 2018. They will fix it and I hope no one is hurt during this process only atechguy, son of a google and Samsung. The update was there since October 2018. More than a month.